Model 66355 includes fun blue and black graphics with uv protectants to ensure longevity. The spring-loaded break-away dunking rim makes for a fun intense game and for dunking contests. 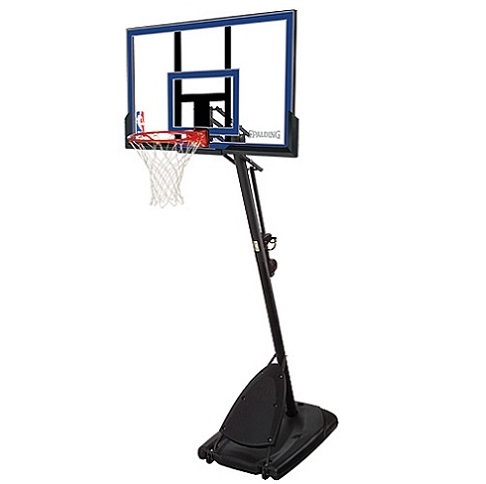 The built-in rebounder gives an added accessory to help keep the ball under the hoop. The adjustment in the back makes for a quick change from adult play to the little ones. Enjoy basketball at your own convenience. Acrylic is the quietest material next to tempered glass. Plays closely to glass, but half the price. Backboard Frame: Steel frame around perimeter and behind center. Hardware Configuration: Compression Spring for competitive dunking. Net: All-weather cotton white net. Height adjustment name: Exacta Height™ Adjustment Mechanism. Black handle on back of pole. Trigger squeeze releases mechanism to lift up and down. Releasing trigger locks hoop into place. Exacta Height™ Adjustment Mechanism uses spring technology to raise and lower the backboard. Adjustment Increments: Rim height adjusts from 7.5 feet to 10 feet in 6” increments stopping when you release the trigger. Fill Material: 34 gallons of water or sand. Fill plug on top and drain plug on side for portability. About 50% of water must be drained to easily move around. Replacement caps available. Warranty: 5-years manufacturer’s warranty. Copy of receipt required. Rims and backboards damaged from falling over are not covered. Please ensure you follow the owner’s manual instructions to prevent the 66355 bball goal from falling over. Footprint dimensions: 55 inches L x 37 inches W.
Shipping weight: about 111 lbs. Shipped dimensions: 55.10 inches L x 37 inches W x 12.60 inches H.
Here are the Spalding basketball goal instructions for the Spalding basketball hoop model 66355.